Stourbridge /ˈstaʊərbrɪdʒ/ is a market town in the West Midlands county of England. Situated on the River Stour, it was the centre of British glass making during the Industrial Revolution. The 2011 UK census recorded the town's population as 63,298. Conservative MP Margot James has held the Stourbridge parliamentary constituency since 2010. Stourbridge is approximately 13 miles west of Birmingham, the second biggest city in the UK. 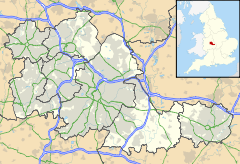 Sitting within the Metropolitan Borough of Dudley at the edge of the Black Country, Stourbridge includes the suburbs of Amblecote, Lye, Norton, Oldswinford, Pedmore, Wollaston, Wollescote and Wordsley. Much of Stourbridge consists of residential streets interspersed with green spaces. Mary Stevens Park, opened in 1931, has a lake, a bandstand, a cafe, and a mixture of open spaces and woodland. Bordered by green belt land, Stourbridge is close to countryside with Clent Hills to the south and Shropshire and Kinver Edge to the west. Stourbridge was listed in the 1255 Worcestershire assize roll as Sturbrug or Sturesbridge. The medieval township was named for a bridge which crossed the River Stour. Ir lay within the manor of Swynford or Suineford (now Old Swinford), which appears in William the Conqueror's Domesday Book of 1086. In 1966, the Stourbridge border between Worcestershire and Staffordshire, which for centuries had been marked by the River Stour, was moved a couple of miles north when Amblecote was incorporated into the Borough of Stourbridge. Following the Local Government Act 1972, Stourbridge was amalgamated into the Metropolitan Borough of Dudley and became part of the wider West Midlands county in 1974. The town gives its name to local glass production, which has been manufactured since the early 1600s. The local glass proved particularly suitable for the industry, taken up predominantly after the immigration of French coal miners in the Huguenot diaspora. However, most of the glass industry was actually located in surrounding areas including Wordsley, Amblecote and Oldswinford. The rich natural resources of coal and fireclay for lining furnaces made it the perfect location for the industry. Glass making peaked in the 19th century, encouraged by the famous glass-making family, the Jeavons. The 1861 census identified that 1,032 residents of Stourbridge were involved in the glass trade in some way. Of these, 541 were glass workers - an increase from 409 in 1851, believed to be partly caused by the collapse of the glass industry in nearby Dudley in the 1850s. The vast majority of those involved in the glass trade came from Staffordshire, Warwickshire, Worcestershire and Shropshire. 9% came from other parts of England and 0.2% had come from abroad. Of particular note are glass cutters, as 8.1% had come from Ireland, believed to be as a result of the decline of the Irish glasscutting industry in the first half of the 1800s. The houses inhabited by glassworkers were of a much better quality in comparison to the slums in which the nailmakers of Lye and Wollescote lived. However, only a few glassworkers owned their own houses. Stourbridge glass is recognised as amongst the finest in the world. However, in recent years, the industry has been almost obliterated by the effects of globalisation, with the glassmaking companies moving abroad. The Red House Cone, thought to be the only complete remaining glass cone of its kind, stands on the Stourbridge Canal at Wordsley. It is the site of the Red House Glass Museum and there are regular demonstrations of blowing glass in the traditional way, and a collection of Stourbridge glass can be seen at Broadfield House Glass Museum in Kingswinford. The other landmark heritage site is that of Tudor Crystal, also standing on the side of the canal, at Amblecote. Tudor Crystal is the last remaining fully functioning glassmaking factory in Stourbridge to be making lead crystal in full production. Today, Stourbridge is one of the more affluent towns in the Dudley Metropolitan Borough although it continues to suffer deprivation in parts. Some people retain the traditional Black Country accent and dialect. The town centre has seen major regeneration in recent years. In 2014, Lion Health medical centre opened in the renovated former foundry of Foster, Rastrick and Company – where the Stourbridge Lion locomotive was manufactured. The next phase of regeneration on the foundry site will create parkland next to Stourbridge Canal with a "heritage and community hub" named Riverside House. Between 2012-2013 the old Crown Centre and Bell Street multi-storey car park were demolished to make way for a new £50m Crown Centre Shopping Mall at the bottom of Stourbridge High Street Opening in autumn 2013, it is home to a 60,000 sq ft (5,600 m2) Tesco anchor store, a two-level underground car park, six retail stores and a central food court. Stourbridge Bus Station underwent substantial redevelopment and re-opened as Stourbridge Interchange in April 2012. Stourbridge High Street is home to a mix of chain and independent shops, pubs, coffee shops, restaurants, gyms and a yoga studio. Quaint Victoria Passage dates back to the Victorian era. Off the High Street is the Ryemarket Shopping Centre with retailers including Waitrose and WHSmith. Nearby Lye is known for its many Balti restaurants. In 2010, Stourbridge was awarded Fairtrade Town status. Stourbridge Farmers' and Craft Market takes place on the first and third Saturday of every month in the Clock Square. Stourbridge Beer Festival happens every year in late April/early May. Throughout the summer, Mary Stevens Park hosts outdoor live music. According to the 2011 Census, the average age of people in living Stourbridge is 42. Stourbridge Interchange is the main bus station, located in the town centre next to Stourbridge Town railway station. The Interchange opened in 2012 at a cost of £7 million . Network West Midlands is the local bus operator. By bike, National Route 54 of the National Cycle Network links Stourbridge with Dudley via the canal towpaths. The Stourbridge Canal links the town to the Staffordshire and Worcestershire Canal and the Dudley No. 1 Canal. This places Stourbridge on the Stourport Ring, navigable by narrowboat and popular with holidaymakers. There are two colleges in Stourbridge. King Edward VI College was founded in 1552, becoming a sixth form college in 1976. Stourbridge College was formed in 1958 and specialises in art and design. There is also a sixth form at Old Swinford Hospital school, which was founded in 1667 by the Stourbridge-born politician Thomas Foley. The boarding school was named the best secondary school in Dudley, closely followed by Redhill School, an academy also in Stourbridge. Elmfield Rudolf Steiner School is an independent school which follows the international Steiner Waldorf Education curriculum. The International Festival of Glass is held at Ruskin Mill in Stourbridge every two years. Launched in 2004, it showcases the skill and innovation of glass artists, designers and craftspeople. The British Glass Biennale is the festival's flagship exhibition, featuring contemporary work by glass makers in the UK. The exhibition attracts collectors, galleries and museums from around the world. In the late-1980s and early 1990s, three Stourbridge indie bands – The Wonder Stuff, Pop Will Eat Itself and Ned's Atomic Dustbin – all had chart success, selling millions of albums between them and gracing the covers of NME and Melody Maker. Pop Will Eat Itself's former frontman Clint Mansell has since composed musical scores for films including Black Swan and Requiem for a Dream. The 80s metal bands Diamond Head and Witchfinder General also came from Stourbridge, and Led Zeppelin's Robert Plant once attended King Edward VI College (then King Edward VI Grammar School for Boys). Stourbridge is covered by three newspapers: the Express & Star (daily), the Stourbridge News (weekly), and the Stourbridge Chronicle (weekly). Two news websites – BBC Birmingham & Black Country and Black Country Live, launched in 2019  – also cover the area. In addition, Stourbridge is served by commercial radio stations broadcasting from Wolverhampton and Birmingham as well as three BBC Local Radio stations: BBC Hereford and Worcester, BBC Radio Shropshire and BBC WM. From the 1860s until the early 1980s, Stourbridge was covered by the County Express newspaper. The archives are now on microfilm in Stourbridge Library. Stourbridge Football Club, founded in 1876 and nicknamed "The Glassboys", shares the War Memorial Athletic Ground in Amblecote with Stourbridge Cricket Club. Stourbridge Rugby Club play at Stourton Park in nearby Stourton. Other teams include Redhill Volleyball Club, which plays at Redhill School. Stourbridge Running Club also train at the War Memorial in Amblecote. According to the 2011 Census, the majority of people living in Stourbridge identify as Christian (65%). Almost a quarter of people said they had no religion. Less than 1% of people identified as Muslim, Sikh, Buddhist, or Hindu. 43 people identified as a Jedi Knight. Fiona Butler, the 'tennis girl' captured scratching her bare behind in the iconic 1976 Athena poster, was born in Pedmore. The fictional Middle-earth world of Mordor in The Lord of the Rings trilogy is believed to have been inspired by the Black Country of the Victorian era. Author J. R. R. Tolkien grew up in the area. Scenes from the TV series Peaky Blinders have been shot at the Black Country Living Museum in nearby Dudley. In other literature, Stourbridge appears in Finnegans Wake by James Joyce, published in 1939 (part 1, episode 6, page 184). The town also gets a mention in The Cantos of Ezra Pound, a long, incomplete poem mostly written between 1915 and 1962 (Canto LXVI, line 30, page 380). Pound's epic poem is inspired by a diary entry from 1786 written by John Adams, the second President of the United States, which mentions Stourbridge. Stourbridge Golf Course is also mentioned by P. G. Wodehouse in Money for Nothing, published in 1928 (chapter 5). ^ "All UK Towns & Cities in Population Order (2011 Census)". LoveMyTown.co.uk. Retrieved 18 December 2015. ^ "Margot James MP". GOV.UK. Retrieved 26 February 2019. ^ Haden, H. Jack (1980). "Stourbridge in Times Past". Countryside Publications. ^ "The Domesday Book Online". Retrieved 26 February 2019. ^ a b Matsumura, Takao (1984). "Flint glass makers in the local community". The Labour Aristocracy Revisited: The Victorian Flint Glass Makers, 1850-80. Manchester University Press. pp. 149–161. ISBN 0-7190-0931-6. ^ Philips, David (1977). Crime and Authority in Victorian England: The Black Country 1835-1860. Taylor & Francis. p. 29. ISBN 0-87471-866-X. ^ "2011 Census & Index of Multiple Deprivation". Dudley Metropolitan Borough Council. Retrieved 25 February 2019. ^ "£50m Stourbridge Tesco opens after year of work". Express & Star. 31 October 2013. Retrieved 31 October 2014. ^ "Wollaston and Stourbridge Town Demographics". localtownstats.co.uk. Retrieved 25 February 2019. ^ "Train operators chuffed at Stourbridge Shuttle success at industry 'Oscars'". Stourbridge News. 7 October 2016. Retrieved 25 February 2019. ^ "New £7m Stourbridge Interchange opens to passengers". BBC Birmingham & Black Country. 22 April 2012. Retrieved 25 February 2019. ^ "More about King Edward's". King Edward VI College Stourbridge. Archived from the original on 20 March 2012. Retrieved 4 March 2012. ^ "School History". Old Swinford Hospital School. Archived from the original on 22 July 2012. Retrieved 4 March 2012. ^ "These are the best secondary schools in Dudley". Birmingham Live. 30 June 2018. Retrieved 25 February 2019. ^ "About the Biennale". Ruskin Mill Land Trust. Retrieved 25 February 2019. ^ "Wise up suckers! How grebo rivalled Britpop as the sound of 90s indie". The Guardian. 29 March 2018. Retrieved 25 February 2019. ^ "New team hits the ground running with Reach Black Country launch". Behind Local News. 3 February 2019. Retrieved 25 February 2019. ^ "Lord of the Rings link to Black Country past". Express & Star. 26 August 2014. Retrieved 25 February 2019. Wikivoyage has a travel guide for Stourbridge. Wikimedia Commons has media related to Stourbridge.